/ Modified jul 21, 2015 4:02 p.m. 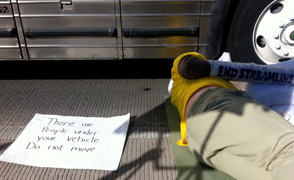 Protesters who chained themselves around the wheels of buses holding immigration detainees in 2013 have been sentenced to time served. The group had been found guilty of two misdemeanors: obstruction of a highway and public nuisance. Justice of the Peace Susan Bacal dismissed the prosecution's request to sentence each protester to 150 hours of community service. They were arrested Oct. 11, 2013 after spending more than four hours on the floor chained to each other in groups of three around the wheels of two buses taking 70 suspected undocumented immigrants to federal court for Operation Streamline, a fast-track, mass deportation proceeding. 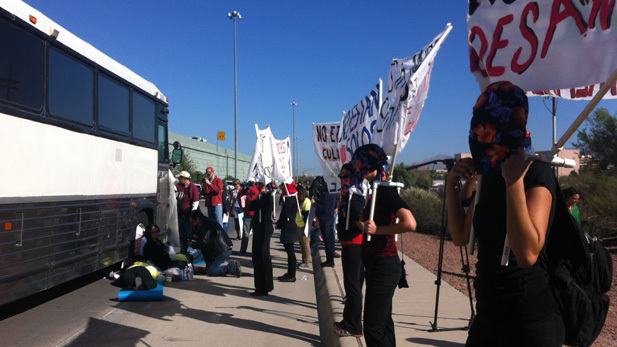 Protesters blocked the westbound Interstate 10 frontage road near 18th Street, stopping the two buses in the roadway. The Tucson Police Department closed the frontage road for several hours and used power tools to cut off the plastic pipes and other materials protesters used to tie themselves to each other. The group spent about 14 hours in jail the day of their arrest. Members of the group spoke at Monday's hearing about why they participated in the 2013 incident and their protest against Operation Streamline. Many shed tears while reading their statements sharing stories of the consequences of family separation and the risks of crossing the desert. For 70-year-old Steve Johnston, one of the protesters, the end of this trial doesn't mean the end of his demonstrations against what he calls "disgusting" policies. "This is the first, the first trial and hopefully we will have many more until (Operation Streamline) ends," he said.